It is often by accident and sometimes it’s even in an errant attempt to put women first; for example I recently read a headline that said ‘Top Female Scientist Discovers…’. Great! But if it had been a male scientist, it wouldn’t have said ‘Top Male Scientist Discovers…’, it would have said top scientist. This perpetuates the idea that a scientist is a man unless otherwise stated. Another example aimed at a more general audience is that infuriating feminine hygiene product advert that has a sassy DJ jumping up and down saying ‘As a woman, I can step aside or step up’. Erm actually, men have the choice of whether to step aside or step up too. Being trod down and overlooked is not just for women. Reversing the gender stereotyping that still leaks its way into the minds of good people, men and women, and alters their subconscious beliefs. 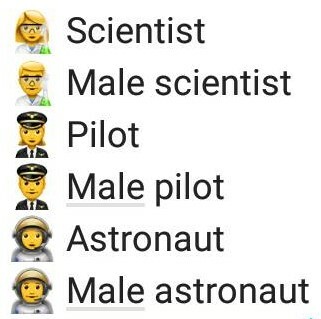 A random example, and not to point fingers, is WhatsApp who only recently brought out male and female emoticons for scientists/astronauts/runners, etc. This is a great step in the right direction but up until their release, it was another subtle, if accidental, way in which women are made second best in the subconscious of everyday people. * Obviously we should all do this for men too! ← Neither a Borrower Nor a Lender Be?